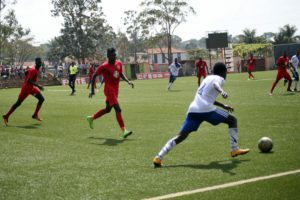 KCCA FC showed class as they defeated fellow Azam Uganda Premier League side Police FC in a buildup game on a day that the football fraternity was fundraising money for former Uganda Cranes player Ausi Kaya. Kaya, who has been fighting cancer for a while now requires Shs20 million to have an operation that hopefully will cure or make him better. KCCA FC took the initiative from the start as they scored two first half goals either side of a Norman Ogik header who grabbed Police’s lone strike of the day. 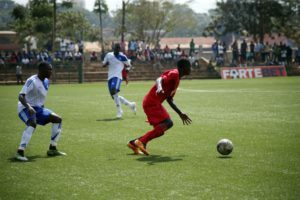 The Lugogo-based side’s first came by virtual of a swift counter attack and Filbert Obenchan threaded a throw ball behind the defence for teenage sensation Allan Okello who easily beat Police’s goalkeeper Douglas Kisembo from close range. Minutes later, Muhammad Shaban broke free after beating two defenders and calmly slotted past the on-rushing Kisembo. Both teams made a couple of substitutions at the start of the second half as KCCA looked to replicate their first half dominance. Five minutes after the re-start, Okello doubled his tally in style much to the amusement of the crowd when he lobbed Kisembo from outside the penalty area to make it 3-1 to the Ksasiro Boys. Substitute Paul Mucureezi scored scored another mid way through the second half finishing off a swift team move that involved several passes put together in the build up. After the game, Ausi Kaya who had been watching from the touchline shaked hands sit both set of players and thanked them for the support. This was KCCA’s last game before the team departs for Madagascar tomorrow morning at 2:45am for their first leg against Madagascan two time league defending champions CNaPS Sports.